Chocolate desserts are my favorites. And when you can find creative and healthy ways to make such desserts without sacrificing the flavors and texture, then they become new favorites. 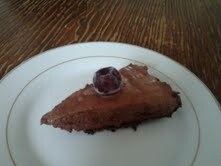 Nothing says is like a guilt-free (well, almost) chocolate silk pie for me. Not only is it vegan but its a no-bake dessert as well! Most chocolate pie recipes that require some baking can be complicated and intricate. But it doesn’t get any easier than a no-bake vegan chocolate silk pie recipe. Its just as rich and flavorful without the excess amount of sugar, fat, and calories. I even include a gluten-free pie crust recipe as well which you would need to use the oven for but that’s it. You always have the option to use crushed cookies or graham crackers if you have a nut allergy. Serve with some fresh fruit, berries, or dollop a cherry on top of each slice. Or you can drizzle a bit of chocolate syrup and sprinkle with some nuts on top. As far as I’m concerned, this recipe is a winner thus far. And the longer it sits in the refrigerator, the deeper the flavors are. If you decide to freeze this pie, take it out of the freezer at least 5 minutes before serving. Preheat oven to 350 degrees. Pulverize walnuts and pecans in a food processor. Mix with margarine and brown sugar. Spread evenly over the base of a 9 inch spring-form pan. Bake for 10-15 minutes. Remove from oven and set aside to cool. Melt chocolate with margarine in a heat proof bowl sitting over a pot of steaming water. Once melted, whisk in coffee, and chocolate liqueur. Set aside. In another bowl, whisk cream cheese, sugar,salt and vanilla until well combined. Fold in the chocolate mixture with the toffuti mixture. Transfer to the spring-form pan. Cover top with plastic wrap and refrigerate for a couple of hours or overnight. This entry was posted in Desserts, Gluten Free, Vegetarian and tagged chocolate silk pie, coffee, dark chocolate, Desserts, liqueur, pecans, tofutti cream cheese, vanilla, vegan, Walnuts. This recipe is inspired by a dip that I had last year. Hubby took me to a wine festival to celebrate our wedding anniversary(which is coming up soon) last year. We were sampling on a variety of wines, liquors, cheeses, and spreads. I sampled a bit of the sun dried tomato paste along with some mozzarella cheese and crackers and my mouth erupted a flavor explosion. I was tempted to buy a container of that sun dried tomato paste which I regrettably did not do. But instead I decided to try to replicate that dip only by adding some fresh chopped basil as well. I made a container of this paste and now half of it is gone. Yes, its that good! And very easy to make. Since sun dried tomatoes tend to be very salty, I don’t see a reason to add more salt. 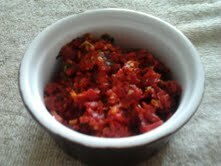 Place tomatoes,basil, garlic, and pepper in a food processor. As its processing, drizzle in some olive oil and lemon juice and continue to process until achieved a paste like consistency. Serve with assorted vegetables, chips, crackers, or cheese slices. *This dip can be made in advance. Refrigerate up to 24 hours before serving. The longer you leave this dip in the refrigerator, the better the flavor. This entry was posted in Gluten Free, Vegetarian and tagged fresh basil, lemon juice, marinated sun dried tomatoes, olive oil, tomato basil paste. Now that I have shared my barbecue chicken recipe with you, you will need a healthy a accompaniment to balance out your meal and nothing does it like a nice bowl of fresh crispy salad. What’s a barbecue or any chicken dinner for that matter without some salad? There are those who would beg to differ but I usually make sure to have something healthy in order to compensate for a heavy meal. That way, I won’t have to leave the dinner table feeling too guilty. 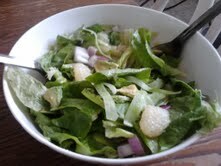 I discovered a similar recipe online but decided not to include a balsamic citrus vinaigrette. I particularly found certain salad dressings to be a bit overwhelming and I much prefer to eat salad as its made. But the choice is yours. And you don’t need to wait till dinner time. I’ve been trying my hardest to combat this kitchen habit I have of oversampling and cooking/preparing dishes that I make. It didn’t matter this time because hubby doesn’t care for fruit anyways 😉 But I know better than do to that when we have company over. Place lettuce in a salad bowl. Cut grapefruit into chunks and toss in. Add on onion and avocado. Using a vegetable peeler, peel each cucumber into long ribbons. Add dressing and toss lightly to coat well (optional). Serve immediately or refrigerate undressed for up to 1 hour. This entry was posted in Gluten Free, Salad, Vegetarian and tagged avocado, cucumbers, grapefruit salad, lettuce, red onion, Salad, vegetarian. The idea of marinading sauces on food goes back pretty far. In the days before refrigeration and written history, someone discovered that smoking meat helped preserve it. Others have also learned that soaking it in salty seawater helped preserve it. Somebody else discovered that packing it in dried salt helped preserve it. Somebody else discovered that leaving it in the hot sun or near the fire so it dried out helped preserve it. We now know that smoke and salt have anti-microbial properties, and that dehydrating foods also delays spoilage. These prehistoric iron chefs discovered that they could also improve flavor and mouth-feel with smoke, salt, seeds, and leaves, as well as basting meat with wine, vinegar, and oils. Especially if the meat was on its way towards funky. Preserved meats, especially dried meats, were often soaked in liquids to bring them back to life as stews, swimming in sauce based on such as water, oil, juices, dairy, and even blood. In fact the word sauce is said to come from an ancient word for salt. 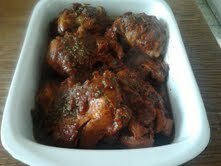 Barbecue chicken was one of my favorite chicken dinners growing up. Most store bought sauces and marinades are loaded with sodium and MSG. I was excited when I discovered that making your own barbecue sauce was not difficult to do. Not to mention, more flavorful and less salty. I’ve seen many variations of barbecue sauces; some of which use all sorts of berries (which piqued my interest). As of now, I will be providing you with a basic barbecue sauce recipe. This sauce is great for meats and can be used for grilling as well. Preheat oven to 350 degrees F. Bake chicken pieces at 350 degrees for about 45 minutes. Drain off fat. In an oiled sauce pan, saute onions until translucent. Add garlic and saute for another 2 minutes. Combine the rest of the ingredients for sauce. Bring to a low boil. Cover chicken with sauce and bake for an additional 15 minutes. This entry was posted in Gluten Free, Meat and tagged barbecue sauce, Chicken, chili powder, crushed tomatoes, meat, molasses, tomato paste, Worcestershire sauce. Shortly after I announced that I was going to attempt to bake gluten-free winter squash muffins, I’ve been inundated with recipe requests. I promised that a recipe will follow if it were a success. I known I’ve been doing a lot of blog post coverage on winter squash. You don’t need me to tell you about my infatuation with this vegetable as I’ve emphasized it numerous times on previous blog posts. Cutting to the chase, I’ve baked muffins before using winter squash. Only this time, I decided to make this recipe a little more celiac-friendly. I originally wanted to use oat flour but my local health food store was out of it. So I went for rice flour instead. You can use barley and oat flour for this recipe as well. The also unique fact about this recipe that its sugar-free. I used agave nectar instead of sugar. Agave nectar is is a naturally sweet syrup somewhat similar to honey. It comes from the agave cactus that grows in Mexico, and it is becoming increasingly popular because it spikes blood sugar levels slower than other types of sugar. Many people are starting to use agave nectar instead of table sugar, honey or artificial sweeteners. Like Splenda, Agave nectar is used as a natural sweetener for diabetics. There have been debates as to whether this syrup should be used as a healthy alternative to sugar. Some will say that the glycemic index of agave nectar is low. It does contain small amounts of calcium, potassium, and magnesium, but not enough to matter nutritionally. Agave nectar does contain fructose which having large does of it can cause s insulin resistance and significantly raises triglycerides (a risk factor for heart disease). It also increases fat around the middle which in turn puts you at greater risk for diabetes, heart disease and Metabolic Syndrome. The bottom line is that sugar and sugar free sweeteners can have serious health and medical repercussions if you don’t monitor the amount you consume. This also applies to anything else you overeat. Which is why I use sugar and agave nectar or any sweetener for that matter sparingly. Because frozen packaged winter squash is not available at my local store, I made a winter squash puree. I included instructions on how to make it. If you do decide to use the frozen packaged stuff, then this winter squash puree recipe is not applicable for you. Yes making puree from scratch may be more labor intensive but it tastes more fresh. I used a pound of acorn squash to make the puree but you can use butternut squash or kabocha squash as well. So when I tried this gluten-free and sugar free method of making these muffins, this is the conclusion I came to. 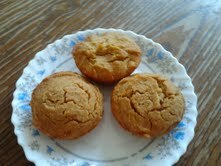 Because I used gluten free flour, the muffins came out more dense than they would have if I’ve used regular flour. Regardless, they were good and consumed within 2 days. I would definitely consider making and publishing more gluten free and sugar free desserts and snacks in the near future. Preheat oven to 400 degrees F. Cut each acorn squash in half. Drizzle the inside with olive oil. Season with a bit of salt and pepper. Line them on a baking sheet flesh facing down. for for about 40 minutes or until you can easily pierce a fork through the flesh. Remove from oven at let it cool. Remove and discard seeds using a spoon. The scoop out the flesh and transfer to a food processor or blender. Puree till smooth. Set aside. Lower the oven temperature to 350 degrees. Whisk all the dry ingredients together in one bowl. In another bowl, combine all the wet ingredients. Combine wet and dry ingredients together. Fold in acorn squash puree and mix well. Scoop each batter evenly in a greased 12 cup muffin tin. Bake for 25-30 minutes (it took me 20 minutes) or until an inserted toothpick comes out clean. This entry was posted in Breakfast, Vegetarian and tagged agave nectar, breakfast, Gluten-Free, muffins, snack, sugar-free, vegetarian, winter squash. Preheat oven to 400 degrees F. Spread vegetables evenly over a roasting pan. Drizzle with olive oil. Season with salt,pepper, and rosemary. Roast for 40 -45 minutes or until soft. Allow the vegetables to cool. Remove peels from onion and garlic. Transfer everything into a food processor. Add lemon juice and cilantro. Blend well till smooth. If its a big chunky, don’t worry about it. 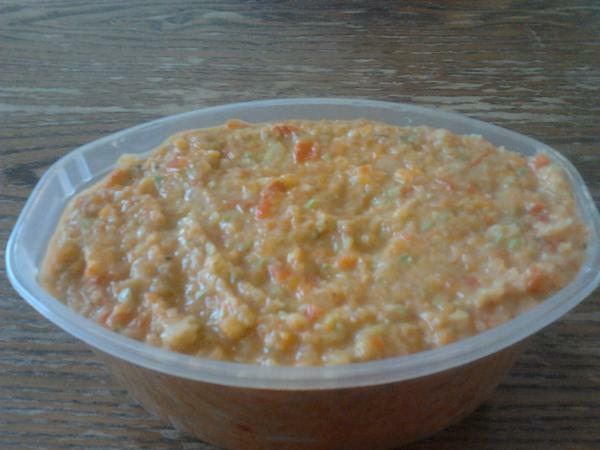 Transfer to a plastic container and refrigerate up to 3 days. Serve with corn chips, pita chips, or toasted bread. Enjoy! This entry was posted in Gluten Free, Vegetarian and tagged chili pepper, dip, Garlic, Gluten-Free, olive oil, onion, red bell peppers, roasted pepper zucchini dip, spread, vegetarian, zucchini. I love what Food and Wine magazine has to put forth. I tend to borrow their recipes but I find a lot of them to be a bit complicated and sometimes hard to follow. I much prefer one pot/one pan meals and their recipes entail a lot of steps which can sometimes be confusing. I enjoy cooking a lot but I don’t like recipes that are too time consuming and hard to make sense. I try searching for ways to break down complicated recipes while retaining the flavors. I’ve decided to simplify this recipe. I added more veggies as well. It only takes minutes to prepare and does not require a lot of ingredients or anything unique. I made this over the weekend when I had company over for a meal. I was surprised that they’ve spared us two drumsticks. I’ve obviously doubled this recipe. Preheat the oven to 400 degrees F. In a large roasting pan, toss the squash, apples, celery,onions and sage with the olive oil and season with cinnamon,nutmeg,paprika salt and pepper. Season the chicken legs and set them on top. 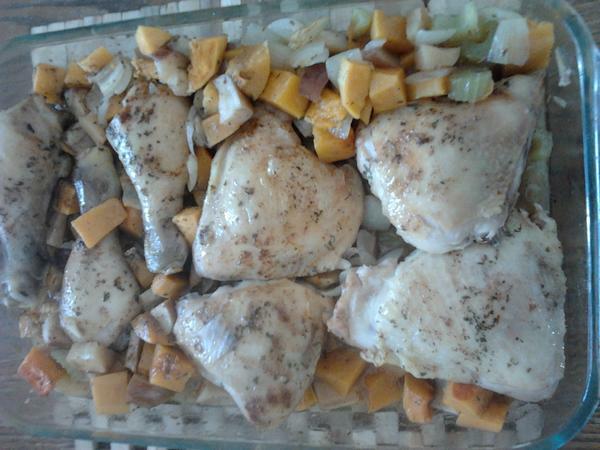 Pour wine over chicken and roast for about 1 hour and 15 minutes, until the squash and apples are tender and the chicken is browned and cooked through. Transfer the chicken to a plate and keep warm. Place the roasting pan over a burner and boil, stirring, until the pan juices are reduced, about 5 minutes. Return the chicken to the pan and serve. This entry was posted in Gluten Free, Meat and tagged Apples, butternut squash, Celery, Chicken, meat, onion, rice, white wine.